The 18-year-old knows that a loss to Ooi Kah Yan in the quarter-finals of the RedTone KL Junior Open squash championships today will surely jeopardise her chances of making the squad for the Girls’ World Junior Team Championship next July. Zoe is the third-ranked junior in the country – behind world No. 51 S. Sivasangari and Andrea Lee – and played a key role in helping Malaysia reach the semi-finals in the world junior teams’ last year. But world No. 107 Zoe has been struggling to produce results in individual tournaments. With the likes of 16-year-olds Kah Yan, Lai Wen Li and Chan Yiwen as well as 14-year-old Aifa Azman fast catching up, Zoe knows she can’t afford to slip up – not even at the ongoing KL Juniors. 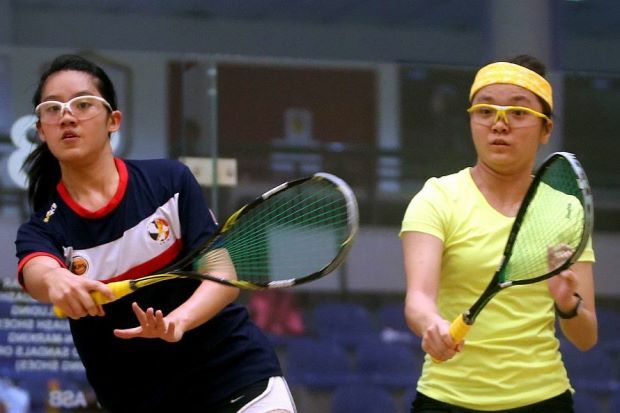 Zoe, who finished as Asian Junior Championships runner-up four times, made sure of that with an 118, 11-9, 11-7 win over South Korea’s Oh Sung-hee in the second round of the Under-19 category at the National Squash Centre in Bukit Jalil yesterday. World No. 121 Kah Yan showed that she too was up for the challenge as she defeated another South Korean – Song Dong-ju – 11-6, 11-8, 11-5 to set up the quarter-final clash 11-4, 11-8, 11-6; Darryl Gan bt Akash Singh 11-5, 11-6, 11-7. GIRLS Second round Under-19: Andrea Lee bt Shehana Vithana (Aus) 115, 11-3, 11-5; Sara Chew bt Steffi Chan (Sin) 11-7, 11-5, 12-10; Lai Wen Li bt Yaisha Putri Yasandi (Ina) 11-5, 11-3, 11-3; Nur Aliah Izzati bt Teh Min En 1311, 11-2, 11-3; Zoe Foo bt Oh Sung-hee (Kor) 11-8, 11-9, 11-7; Ooi Kah Yan bt Song Dong-ju (Kor) 11-6, 11-8, 11-5; Au Yeong Wai Yhann (Sin) bt Nurina Najib 7-11, 11-9, 11-8, 11-7; Lynette Vai (Png) bt Alexandria Aloysius 11-5, 11-8, 11-5. Third round Under-15: Wong Heng Wai bt Ayumi Watanabe (Jpn) 11-5, 12-10, 11-6; Yee Xin Ying bt Ong Jia Wen 11-1, 11-5, 11-2; N. Shasmithaa bt Low Jia Hui 112, 11-7, 9-11, 9-11, 11-9; M. Kiroshanna bt Teoh Liyen 12-10, 9-11, 11-8, 11-4; Aira Azman bt Nur Aishah Asrin Syarifah 11-4, 11-1, 11-5; Noor Ainaa Ampandi bt M. Remashree 14-12, 11-1, 11-7; Nurul Farzana Fairuz bt Rafu Takahashi 11-3, 11-5, 11-4; Jessica Keng bt Anis Sofea Arif 11-1, 11-3, 11-0. Under-17: S. Sneha (Sin) bt Taylor Jones (Aus) 11-2, 11-5, 11-5; Amirah Rusydina Rosli bt Amalia Rios (Col) 4-11, 11-6, 11-7, 12-10; Carina Loi bt Nur Syazreen Atiqah 11-6, 11-7, 11-4; Lee Jia Wei bt M. Krisha 11-4, 11-3, 11-2; Seo Hyo-ju (Kor) bt Angie Ooi 11-8, 12-10, 11-8; Nurul Izzah Abdul Razak bt Abbithra Devi 11-3, 11-3, 11-6; Bernyce Tay (Sin) bt Nisa Nur Fadhilah (Ina) 11-5, 6-11, 11-4, 11-6; Chan Yiwen bt Christy Ko (Sin) 11-4, 11-1, 11-6. with Zoe. “It’s really important for me to win … because Kah Yan and I know that whoever wins will stand a better chance of making the world juniors squad,” said Zoe. Top seed Andrea, who is making a comeback after suffering an ankle injury in September, enjoyed an easy start – beating Australia’s Shehana Vithana 11-5, 11-3, 11-5. She faces Penang’s Sara Chew for a place in the semi-finals.